Does an Algae Scrubber reduce Dissolved Organic Carbon through Photosynthesis?? I run an algae scrubber. 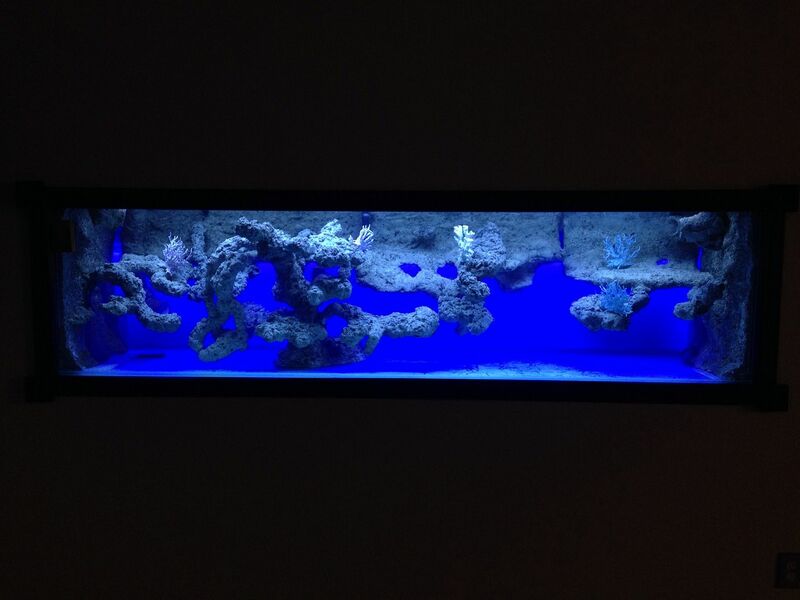 Besides live rock, activated carbon & a 30% water change every month or two I have no other filtration. I have several Tangs & various corals. PO4 & NO3 read zero. A noticeable difference in my tanks water chemistry occurred after the scrubber screen matured. The alkalinity fell but settled at NSW level; 125 ppm. I add bicarb, it settles back at 125ppm after a couple of days. The reason my alkalinity stays at a lower concentration is due to the action of photosynthesis by the algae in particular. Why! So, Algae, & all other photosynthesising organisms, need to derive their source of carbon during photosynthesis from other sources using various mechanisms. Bicarbonates in the water is at least one source. This is why my alkalinity content falls. 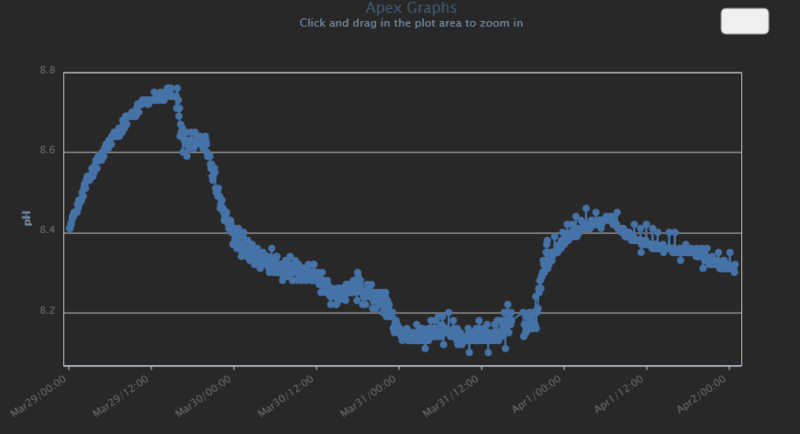 So, what I am wondering is, why my algae continues to grow strongly but the alkalinity level remains at 125 ppm? Why doesn’t the alkalinity continue to fall as the algae continues to grow & continues to need a source of carbon? Is the algae able to derive carbon from the dissolved organic carbon (DOCs) in the aquarium water? No, only heterotrophs or mixotrophs can. why my algae continues to grow strongly but the alkalinity level remains at 125 ppm? Because CO2 dissolves into the water. Slowly. When a scrubber is growing too fast for this, alk is reduced. Dosing alk can help the scrubber grow faster. Thanks for the reply santa monica, although perhaps you did not understand my post. I'll try to be clearer. I understand that photosynthesis requires light + water and carbon dioxide. But carbon dioxide in ocean water, at a pH above 7.4, is almost non-existent as it is almost totally converted into bicarbonates & carbonates. So the algae in my scrubber, for instance, has mechanisms whereby it can obtain the carbon dioxide it needs for photosynthesising from bicarbonates rather than directly taking up co2. Or chemically speaking, it removes the CO2 from HCO3-. This is why my alkalinity has settled at a lower level (125ppm) than it was before my scrubber screen matured. If I dose bicarb the alkalinity level falls quickly back to 125ppm. But, without dosing bicarbonate, alkalinity appears to remain at 125ppm while the algae continues to grow strongly. If this is correct perhaps the algae is obtaining CO2 from another chemical other than bicarbonates? Your list of vitamins, carbs, amino acids etc., are dissolved organic compounds. They are the result of photosynthesis. Carbon dioxide + water + light = carbohydrate plus oxygen. All those compounds on your list contain carbon. So, can photosynthesising organisms obtain CO2, in ocean water at a pH of 7.4 & above, from the carbon in dissolved organic compounds? Without dosing alk, the slow process of CO2 dissolution into the water has stabilized with the algal uptake, in your case, at 125 ppm. CO2 is going into the water (from fish too), and then to the algae. What you don't see is the rate of transfer; it is very high, like a flowing river. But the river is shallow. Algae would grow faster if more alk were available; that it why when you dose, it is used up right away. Extra rates of growth may be noticed or not; it may take two days to double in size instead of one day, and you still only notice the final size, but the increase in rate would be a 100% faster rate of uptake. And no, algae cannot get carbon from organics, dissolved or particulate. Organics must first be re-mineralized by bacteria, into A, N and P.
Ok, that makes sense, its an equilibrium thing. Sponges are consuming the DOC produced by corals and algae and converting it into DIC aka HCO3-. my understanding is that the gas levels in the water are in equilibrium with the levels in the air. This is especially true if you have a skimmer or another source of air injection, but the large surface area of the tank water works well too. Any CO2 consumed by the algae is replaced from the air through the water to maintain equilibrium. In fact, most indoor tanks have a lower pH (~7.8) because of the naturally higher CO2 levels in air increasing carbonic acid (dissolved CO2). Unless you have more algae than other CO2 sources (respiration, etc...), you have a continuous source. But the atmospheric source cannot keep up with rapid consumption by algae. So the algal growth slows until equilibrium with the source is reached. Atmospheric CO2 is sufficient. Why wouldn't it be? Do the plants in a house stop growing indoors? The algal mass is absorbing CO2 in the atmosphere and that's pretty abundant. Trees, flowers, grass, bushes... everything that photosynthesizes (I think) consumes CO2 & there's plenty on the planet. Might be a good question on the chemistry forum. Karimwassef said – “Atmospheric CO2 is sufficient. Why wouldn't it be? seawater at a pH of 8.2 has almost no CO2, or carbonic acid. The carbonic acid that is formed, when carbon dioxide hydrates, very quickly equilibrate into the water's carbonate buffer system, converting into both bicarbonate and carbonate by releasing protons (H+). The primary factor that determines the relative amount of each species at equilibrium in seawater is the pH, with a small temperature effect as well. Bicarbonate is then the predominant source of CO2 for seawater photosynthesising organisms. Many marine algae and other organisms take up some measurable portion of the carbon dioxide that they incorporate during photosynthesis. But, in most cases this process can account for only a portion of the demand for carbon dioxide. The rate at which carbon dioxide is used by rapidly photosynthesizing organisms is fast enough that organisms can deplete the carbon dioxide in the surrounding seawater faster than it can be replaced by diffusion and other transport mechanisms through the seawater. So, if the incoming CO2 is rapidly being used up before it is hydrated into carbonic acid, & then consequently bicarbonates, the alkalinity falls (but stabilizes at 125ppm in my case). Datapoint. I was curing ~100lbs of concrete in my tank (before life). 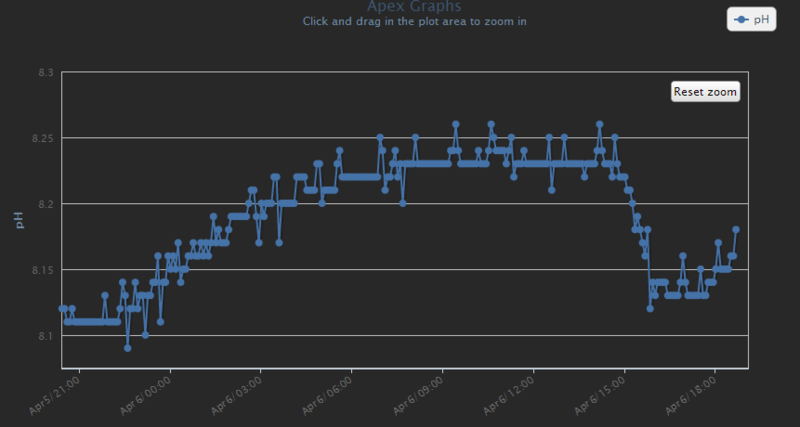 pH dropped to 9 very quickly and then stabilized to 8 within a few hours. This was in ~500gal of tap water. I kept this up for a couple of weeks - pH never went above 8.3. I would occasionally turn the skimmer off to test the "curing"
math problem: how much CO2 does it take to do that and how is it that this abundance of CO2 is not available to algae? My conclusion - as quickly as the algae (or in my case concrete) consumes CO2, it is replenished - the state it is in CO2, carbonate or bicarbonate doesn't matter. Last edited by karimwassef; 01/15/2017 at 04:45 PM. Found some plots I took while curing. 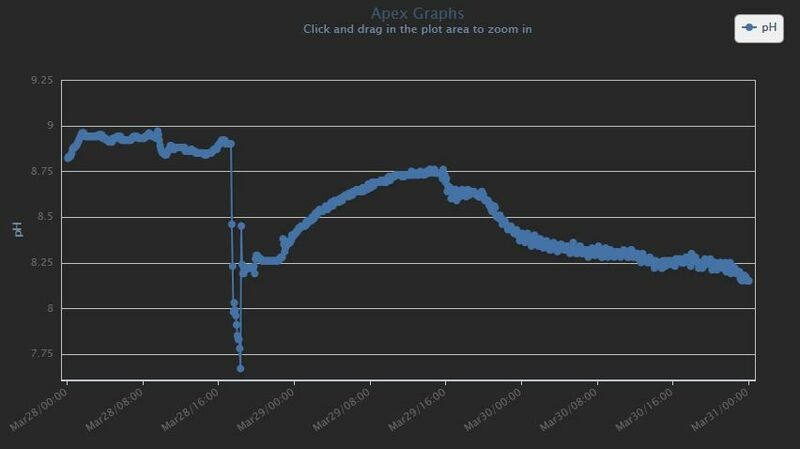 Every time I would turn the skimmer off then on, you can see the rise and then drop in pH. Unfortunately, I didn't capture the initial pH drop, but I think this shows what I'm talking about. Basically - the water and air will find equilibrium. If my pH is too low, I turn on my skimmer and up it goes. If my pH is too high, I turn on the skimmer and down it goes. It doesn't matter if this is CO2, carbonate or bicarbonate... it is available and is pulled in from the air. To keep Alk and Ca, I dose kalkwasser and that also impacts my pH but the primary driver is still CO2 in the air. Last edited by karimwassef; 01/15/2017 at 04:44 PM. My conclusion - as quickly as the algae (or in my case concrete) consumes CO2, it is replenished. Quote - Freshwater aquarists caring for brightly-lit planted aquaria have long known the importance of CO2, and often add carbon dioxide directly to the aquarium water in one way or another to supply those tanks' substantial need for this material. It is converted into carbonates but the source is still atmospheric CO2 pushing equilibrium. Maybe my skimmer is my forcing function. 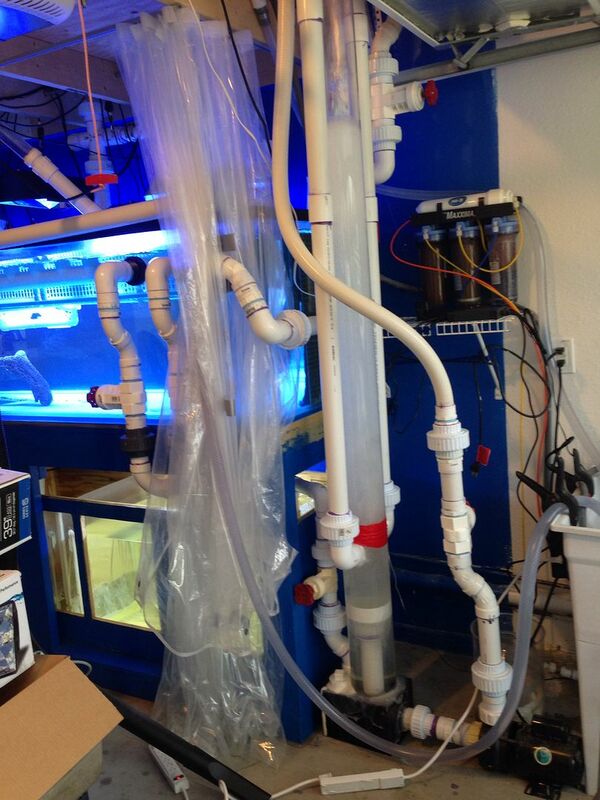 A freshwater tank with a large skimmer may be as effective as CO2 dosing. So what you’re saying above, is, that without artificial diffusion of CO2 into the tank water via aeration by protein skimming, the pH would settle at 11. Natural diffusion, by the partial pressure of CO2 in the air in the vicinity of the tank was not fast enough to maintain the pH below 11. The lime water consumed it too quickly. This is the point I’m making in regards to my aquarium, & SantaMonica pointed out earlier. The algae in my scrubber consumes bicarbonates faster than the natural diffusion of CO2 can replace it until it has dropped to 125ppm where an equilibrium has been reached. Equilibrium was reached, at a pH in your case, of 8.3, by artificial diffusion via skimming aeration. No higher, no lower. You don't run a skimmer or any other air injection? On a reef? 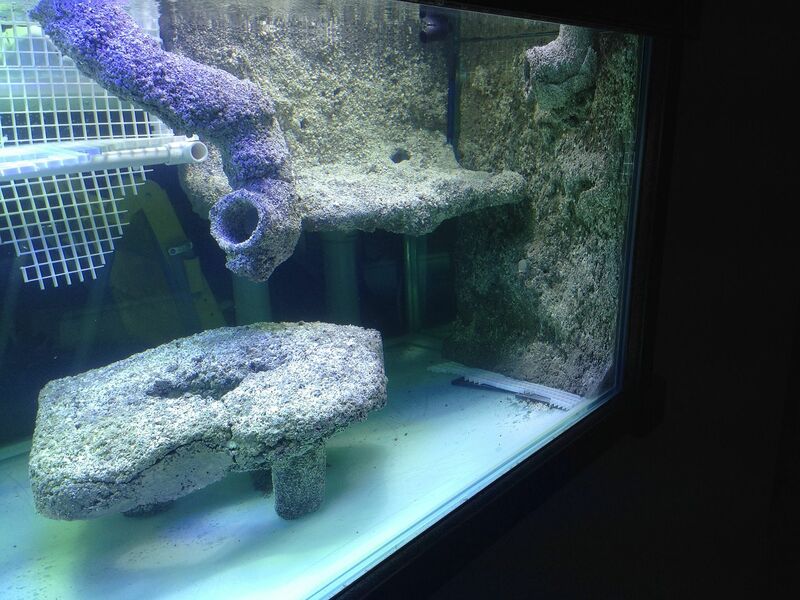 In the OP I stated I run a scrubber, activated carbon, live rock & occasional water changes. Air injection for what purpose? & a skimmer for what purpose? Air exchange is a key variable in a reef. Here, we identified another driver in carbon to feed algae. When I shut down my 12' skimmer, I added a 3' x 4' waterfall scrubber. When I shut down the scrubber, I added a 4' x 2" PVC air injection shaft. In regards to CO2, the aeration of water by skimming is normally for removing excess co2, from the fishies, etc. In your example of the concrete tank above the limewater created ate up the co2 to a great level. My scrubber does more than enough air exchanging. And I'm happy with an alkalinity level at 125ppm. Not quite. As algae use bicarbonate & carbonate from the water, it consumes the dissolved co2 gas in solution. This in turn due to “partial pressure law” allows more atmospheric co2 to enter the water. You are carbon dosing, nature’s way. Last edited by Subsea; 11/09/2017 at 09:33 AM. Yes; I've since learnt from the guru Farley that the alkalinity doesn't fall because the hydroxides that remain after the carbon atom is removed via photosynthesis instantly take up another carbon atom. Its like when using kalkwasser (calcium hydroxide); the hydroxide is what raises the alkalinity. Last edited by Belgian Anthias; 11/20/2017 at 05:08 PM. [QUOTE=SantaMonica;24904825]No, only heterotrophs or mixotrophs can. There are numerous species of algae that are heterotrophic and mixotrophic..